This post shares our submitted materials for an Improving Teacher Quality Higher Education Grant available from the South Carolina Commission on Higher Education (CHE). The funding opportunity announcement (FOA) for this is available here. The full proposal was submitted on September 29th, 2016, and was defended in person at the SC CHE offices on Friday, October 28th, 2016. In this post I’m sharing the proposal narrative as well as the presentation materials used for our defense. We do not share the budget, budget narrative, or additional signature/planning documents. The purpose of this post is to be open and transparent in the grant proposal writing process. These materials are for educators and students that may be interested in grant writing but are looking for materials to serve as a guide. I believe these elements are key as I strive to be a digitally agile researcher. Project ELATED (English Language Arts and Technology in Education) will increase student achievement for elementary students in Charleston County area schools by building teachers’ content knowledge in traditional print and digital literacy as guided by the South Carolina Read to Succeed Literacy Competencies. This proposed project will form a partnership between members of the Department of Teacher Education (TEDU) and the English Department at the College of Charleston (CofC) with educators from the Charleston County School District (CCSD) to build leadership and instructional development partnerships across the ELA/Reading Department. This proposed project will work with educators to collaboratively compose an online professional development website that builds the content and pedagogical knowledge needed to teach reading and writing in traditional and digital contexts. This is a definite focus and need for CCSD educators as budgetary cuts have decimated ELA/Reading programs across the district as educators adjust to the Read to Succeed state requirements. Reading and writing educators also need to adjust their content, delivery, and pedagogy as new and digital literacies change what it means to be a reader and writer. The central purpose of Project ELATED is to increase student achievement for elementary students in Charleston County area schools by building teachers’ content knowledge in traditional print literacy as well as digital literacy. This purpose is defined by three specific goals of this project. The first goal is to increase elementary teacher Content Area Knowledge in ELA/Reading while infusing digital literacies in instruction. In this project, ELA/Reading includes instruction in reading and writing that is interdisciplinary, standards-based, and guided by the SC Read to Succeed Literacy Competencies as well as the SC College and Career Ready Skills. The second goal is to build the pedagogical content knowledge necessary to authentically and effectively embed digital literacies into elementary ELA/Reading instruction. Through the efforts of Project ELATED, we will promote and develop the use of technology-infused, inquiry-based models that will enhance ELA/Reading education in elementary schools across the district and beyond. 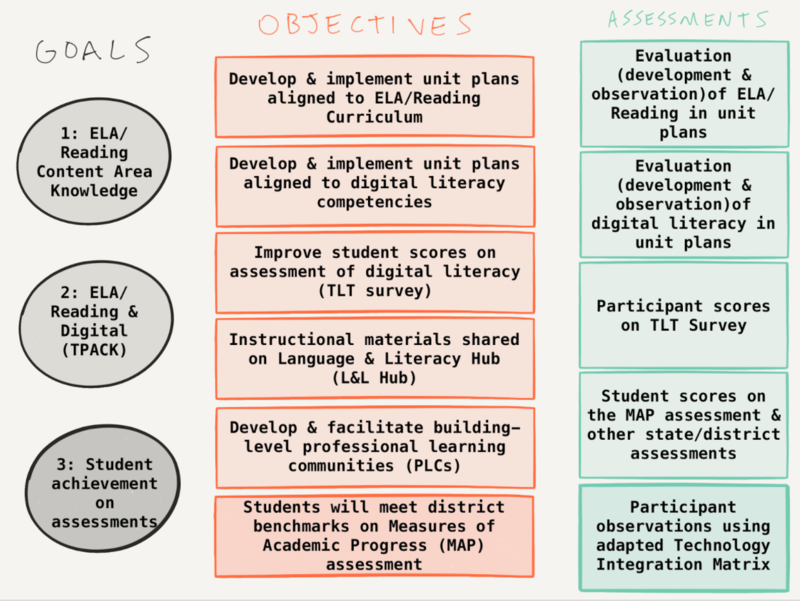 The third goal is to increase student learning in the classrooms of project participants as evidenced by student learning objectives (SLOs) in district and state assessments. NOTE: I posted the earlier guides on writing good research questions, identifying goals & objectives, as well as developing logic models to organize your research. The logic model was one of the most helpful steps I added in to my grant writing practice. I hope that it helps you. The full proposal narrative for Project ELATED is available in the Google Doc embedded below. You can click here to go directly to the document. The permissions on the doc are set up to allow you to comment on the proposal narrative. The proposal was defended in a face-to-face session on October 28th, 2016. The structure of the session was 20 minutes for the presentation, and then 20 minutes for questions from the assembled panel. The slide deck is primarily text used to highlight elements of the proposal and the rubric used by the review panel. I also used the Paper app to sketch out two figures for use in the presentation materials. An example of one of these figures is the table included above that details our goals, objectives, and assessments. The slides for the presentation are embedded below, or by clicking on this link.